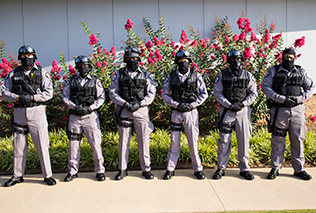 The Newton County Special Response Team was created on July 27th, 2004. This team was created to ensure the security of the facility and the safety of the Detention Officers and inmates inside the Detention Center. The S.R.T. team is called upon to handle all levels of disturbances within our facility. The team also routinely conducts searches of inmate cells to ensure that no contraband is brought into our facility. Newton County's Special Response Team was the first "County Team" to be State Certified in Georgia. The S.R.T. team has also been certified as a "Tactical Squad" that can be deployed if surrounding agencies call for their assistance.